A Surprise Black Friday Giveaway! It’s Black Friday, so whatcha’ doin’? Are you eating leftovers? Shopping for deals? Watching football? Putting up holiday decorations? All of the above? 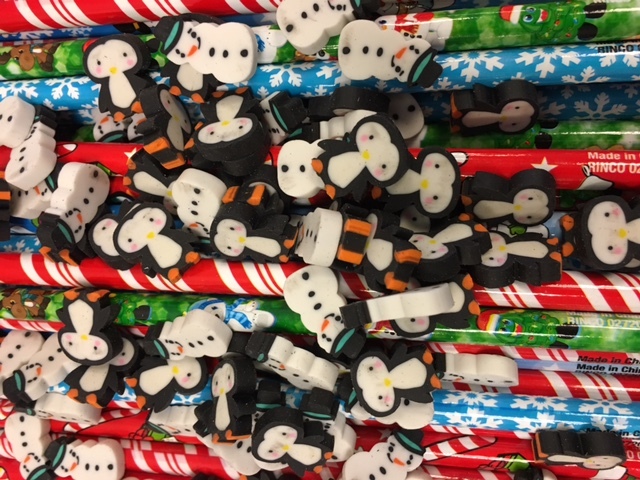 Tell us how you’re spending (or spent) your Black Friday and you’ll be entered in our surprise giveaway that includes some holiday pencils and winter-themed mini erasers. Just be sure to respond right here on the blog by midnight on Sunday, November 26. Enjoy your day! Resting. Need to relax after yesterday! Believe it or not, I am preparing lessons for the students I tutor! It doesn’t seem like work to me though. Trying to get caught up on laundry! After a nice run with my running friend, I’ll be raking leaves, walking the dog, and maybe doing some planning for the upcoming week. Tomorrow is the annual trek north to get our Christmas tree. Can’t wait! Preparing my Black Friday shopping list. Loading dish washer, washing towels, and going to see my 88 year old father. Home and family seems more important than gifts. Wasn’t always like this, phases of life. I got up early and went shopping, now I am relaxing at home! Eating leftovers and shopping black Friday deals in my PJ’s on the couch! Washing clothes..getting a jump on weekend cores ???? I am working on IEPs. A teacher’s work is never done. Decorating the house for Christmas. Shop till I drop. Went to Home Depot for poinsettias. Then off to Body Works for a super deal paid 25.00 and it is worth 115.00. Next off to Pet Smart to buy food and toys for my 2 dogs. Fluffy a 6 year old poodle and Fie Fie a 6 month old terrier. Brought it all home then went out to Burger King for breakfast. Then we went to Belk for delicious Harry and David candy treats. Went to Care center and last to Publix for items I ran out of on Thanksgiving. Came home and wrapped gifts for the dogs and friends. Went in garage and pulled out some decorations for the house. Tired now. The end! I’m preparing for Thanksgiving Dinner – Part Deux, on Saturday! The bread is cubed and drying, the bacon has been fried, and the turkey is brining!! Spending it with family… and lesson planning. Eating leftovers and shopping online. Nothing, because sometimes that’s all you need. Sleeping in and watching movies. shopping then watching Christmas movies tonight! Going to the tree farm with my family and then to a few stores for shopping. I spent my day lounging around and enjoying the peace and quiet! Visiting with family from out of town and braving the crowds so that my teenage daughter could experience Black Friday for the first time! A little early morning shopping followed by a nap, some reading on the deck in the sunshine (75 degrees in KS today!! ), eating of leftovers, and a family celebration for my son’s 16th birthday. Spending time with family, reading, lesson planning, and watching the movie Wonder. Our annual family tradition for the day after Thanksgiving is to pile into the van and drive to a Christmas Tree Farm. We’ve frequented the same farm for the last 20 years – Elves Tree Farm near Sherman, TX. We take a hay ride out to the tree lots and explore until we’ve found the perfect trees to cut down (one year we had 20 trees to haul back, we invited multiple families to join us). In between discussion over which tree is perfect we toss the frisbee, the football, take pictures, drink hot spiced cider, laugh, joke, and talk about the upcoming holidays. We always celebrate with brunch at a local cafe where our daughter always orders the Strawberry Cheesecake Stuffed Blintzes …. Then it’s off to deliver all of the trees to their new homes! A perfect family day relaxing together and walking off Thanksgiving dinner! Laundry, eating leftovers (LOs), making cards, laundtry – 4 loads, eating more LOs – really tasty the second day, yes?, making calendar gifts…going out to dinner because you can eat just so much LOs! Putting up the Christmas ???? Tree. Bought Christmas erasers at Target and working on Formal Observation “reflection”. Preparing snacks for Saturday football binge watching. Black Friday shopping all day!